The portrait, bigger than life-size, features a middle-aged man with the head looking straight forward. The modern bust is cut down at the chest. The age of the man is revealed by the wrinkles crossing the forehead and running to either side of the mouth, by the bags under the eyes and the general relaxation of the skin. The wide eyes, with iris and pupil incised, are surmounted by heavy eyelids; the nose is straight and the mouth is almost completely hidden by the thick moustache. The curly hair frames the high forehead in a rather disordered way; the long, wavy beard is parted in the middle in two separate wisps. 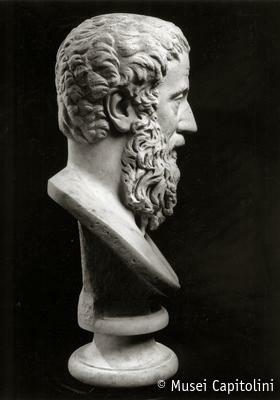 The use of the running drill in the working of hair and beard dates the portrait to the early 3rd century AD. The existence of a number of replicas of the same portrait suggests that it featured a personage of high rank, probably close to the imperial family. Formerly in the collection of the cardinal Alessandro Albani, the portrait was acquired for the Capitoline Museum in 1733. Once in the Palazzo Nuovo, the portrait was initially displayed in the Sala degli Imperatori because of an old and arbitrary identification with the emperor Pertinax (AD 193).